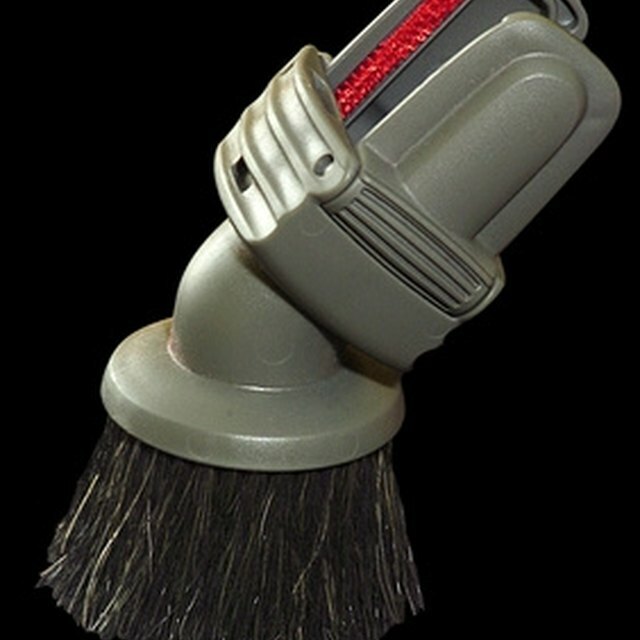 Hair, strings and fuzz accumulate around the brush on a vacuum cleaner during use. Over time, this creates a tangled mess that is hard to clean. If you have cut and pulled at the hair and strings and still have a horrible mess, remove the brush on your Dyson DC14 to clean it. This makes the brush more accessible, giving you easy access to all sides of the brush without twirling it around and around to try to get everything off of it. Pet hair tends to wrap around the vacuum brush. Unplug the vacuum, and lay it on the floor with the front facing down. Turn the three screws located on the soleplate counterclockwise with a coin to remove it. Place the tip of a screwdriver beneath the belt and pull it up and to the right to free the brush, or place a belt removal tool over the end of the brush and pry the belt onto the pegs with the included hook. Grasp the brush on the left end and pull it up and to the left to slide it out from under the belt and remove it. Clean the brush to remove all dirt and debris trapped in the bristles. Cut hair or strings trapped on the brush with a pair of scissors, and pull them off the brush. Grasp the left end of the brush and slide the right end of the brush under the belt, locking both ends of the brush into the base of the vacuum. Lift the belt with the screwdriver to hold it up and slide the brush beneath it, if you removed it with a screwdriver. Use the hook to remove the belt on the pegs of the belt removal tool, if a belt removal tool was used. The belt will slide back into place over the brush. Position the soleplate over the bottom of the vacuum, making sure the tabs on the soleplate and vacuum are aligned. Turn the three screws clockwise with a coin to secure it.